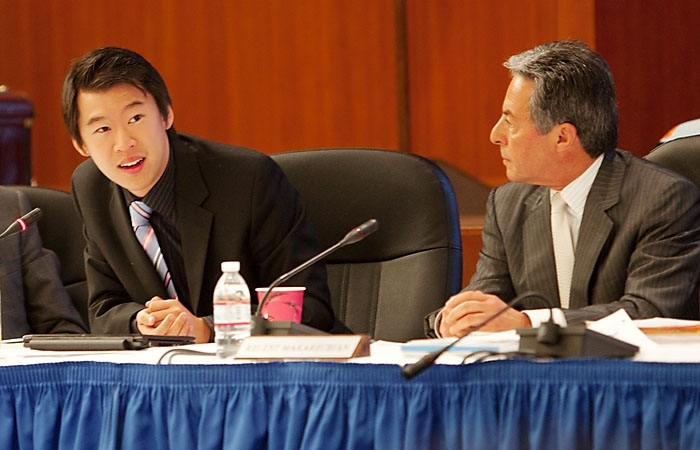 Jesse Cheng (left) speaks at a Regents meeting on Thursday, November 18, 2010. Former UC Student Regent Jesse Cheng announced in an open letter on his student regent blog today that he has decided to resign from his position for personal reasons. Cheng's resignation comes just days before the May meeting of the UC Board of Regents. His successor, Alfredo Mireles, will officially take over the position at that time. In a statement this morning, UC Board of Regents Chair Russell Gould said he formally accepted Cheng's resignation and that Mireles - who had been scheduled to assume the voting position at the July meeting - will move into the student regent position immediately. "We thank Jesse for giving voice to the interests of students as both a Student Regent-Designate and Student Regent," Gould said in the statement. The May board meeting will include topics such as the online education system, creating safe and inclusive campus communities for lesbian, gay, bisexual and transgender students and budget plans for the 2011-12 fiscal year. Cheng - who was found responsible for a student conduct violation of sexual battery by the UC Irvine Office of Student Conduct in March - said in the letter that he regretted resigning before his term came to a close and that he could not complete his duties to the UC student body at-large and the UC community as a whole. "But I make this decision today because I believe it is part of my obligation and what I owe to the students who have supported me, to ensure that students have a full and powerful voice at the Board of Regents, and do what is best for the student community," he said in the letter. Cheng, who submitted the letter to the board on Friday, went on to comment on the decision by UC Irvine's student conduct process, stating that while he respected the decision that was made, he did not agree with the findings and that the controversy surrounding the issue had created a distraction from other student issues that he felt were more important. "It is a much lower standard of evidence than a criminal court, but I also recognize that the process nevertheless applies to me as a student," Cheng said regarding the decision. "My main focus and motivation has always been for students to feel that they have a full and powerful voice on the Board of Regents�I think it would be best for the students and the University of California if I step down at this time."